The two weeks of protest in Egypt seemed to be settling into a pattern, and the press, ever impatient, began to turn away. Then, in two days, protest turned to revolution and coverage of the unrest in the Middle East again dominated the U.S. news agenda. By the time the week was over, February 7-13, the turmoil in Egypt filled 40% of the newshole, according to the Pew Research Center’s Project for Excellence in Journalism. That is down from the previous week’s level of 56%—when the crisis registered as the biggest international story in the four years PEJ has studied the media agenda through its weekly News Coverage Index. But those numbers don’t tell the whole story. In the first half of last week (Monday through Wednesday), coverage of Egypt accounted for 26% of the newshole as the stalemate between President Hosni Mubarak and the protestors seemed to drag on. But from Thursday through Sunday—in the hours leading up to and following Mubarak’s exit—coverage roared back, filling 59% of the newshole—and even more on cable news (93%), network news (69%) and radio news (63%). An analysis of the coverage suggests that in the climactic final days, a celebratory tone about democracy overwhelmed a fearful one about the implications for security in the Middle East. The evidence also suggests that at least one news outlet, Fox, offered a noticeably different vantage point. The Egyptian protests began in earnest on January 25 and led to the fall of Mubarak on February 11. And in the three weeks from January 24-February 13, the Mideast story accounted for more than one-third (39%) of all the coverage measured by PEJ’s Index. The second biggest story in those three weeks, the U.S. economy, generated less than one-quarter of that coverage, at 9%. Last week, no media sector covered the extraordinary events in Egypt as extensively as cable news —a platform that often devotes more coverage to the biggest story of the week than the media generally—this time 59% of the airtime studied. As is often the case with major breaking events, CNN, which has more foreign bureaus and reporters than any other cable network and whose programs are more oriented to breaking news than to talk, devoted considerably more of its airtime studied last week (83%) to the story than did MSNBC (48%) and Fox (43%). Although no subject generated anywhere near the coverage Egypt did, the economy was the No. 2 story last week, accounting for 10% of the coverage on news from the housing sector and the job market as well as Barack Obama’s efforts to mend fences with business. That was followed, at 3%, by news about the Obama Administration itself, some of which focused on the president’s personal habits. The No. 4 story, at 3%, was coverage of U.S anti-terror efforts in a week in which the Homeland Security secretary raised red flags about the threat level. And the fifth-biggest subject, 2%, was a media story—the sale of the liberal Huffington Post site to AOL. In the first half of the week, coverage of Egypt actually began to diminish significantly as the prospect of extended stalemate loomed. “With rallies in their third week, the question is whether the demonstrators have the stamina and resources to fight on—or whether they’ll retreat behind the few concessions Mubarak’s regime has thrown at them,” said a story posted on AOL News on February 9. But on February 10, the media and U.S. officials such as CIA Director Leon Panetta began sending strong signals that a Mubarak resignation was imminent—a prediction that was disproven by the Egyptian president’s speech that day. That generated a new theme in the coverage best described by two words—what happened? Then, on February 11, Vice President Omar Suleiman announced that Mubarak had stepped down, and the scenes in Tahrir Square led some journalists to invoke comparisons to the fall of the Berlin Wall. In attempting to assess the overall tone of U.S. coverage in the week’s two most frantic days—Thursday and Friday—there are some clues to guide us. For example, a search by PEJ found that among some of the key terms used on cable and network evening news broadcasts on February 10 and 11, positive messages seemed to predominate. In order to monitor the contours of the coverage, researchers identified a series of significant terms related to the ongoing events in Egypt. Six of them—including “democracy,” “triumph,” “celebrate” and “pluralism”—seemed to have positive connotations. Another six—including “theocracy,” “Muslim Brotherhood,” “extremism” and “radical”—appeared to have more worrisome connotations. 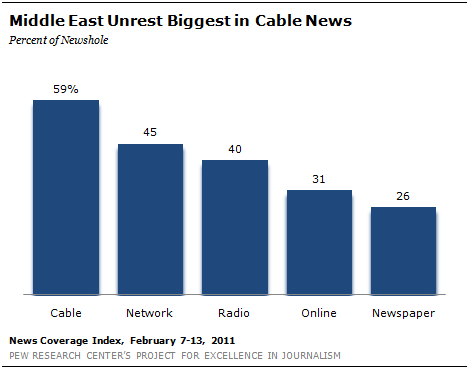 PEJ then tracked the use of those terms on 17.5 hours of cable news and network news broadcasts on February 10 and 11. Of the five terms that appeared most frequently on the programs, four of them—“democracy,” “freedom,” “peace” and “celebrate”—had upbeat implications. Only one, the “Muslim Brotherhood,” would seem to indicate concern or negativity. Moreover, the group of positive-leaning terms appeared about three times as often as the more negative ones. At the same time, the search did reveal some differences in the use of key words between the Fox News Channel and its two rivals—CNN and MSNBC. For example, Fox used the term Muslim Brotherhood about five times as frequently as the other two combined and mentioned Israel about twice as often as CNN and MSNBC combined. Fox News host Sean Hannity and his colleague Glenn Beck were among those in the media expressing the most concern about the ouster of Mubarak. On his February 11 program, Hannity declared that “at the end of the day, I think we have weakened America’s influence in the world” and he warned that the Muslim Brotherhood or a Muslim state could emerge. And once the media documented the sudden transfer of power in Egypt, that narrative was quickly overtaken by another—one driven by speculation, prediction and a dose of ideology. But in the Pittsburgh Post-Gazette, Jack Kelly, a former deputy Assistant Secretary of the Air Force who writes a syndicated column, was more concerned about the possibility of an unfriendly government taking power. “Obama administration cluelessness about the [Muslim] brotherhood is dangerously reminiscent of Carter administration policy toward Iran in 1979,” he wrote. 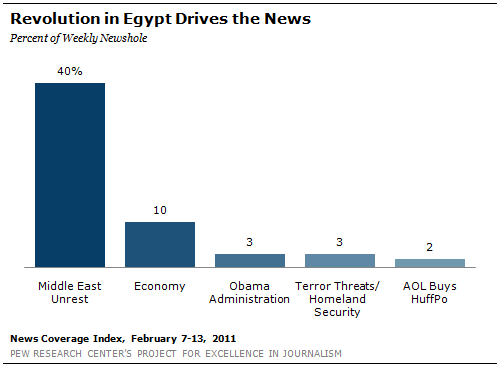 By the end of the week, that question of what will happen next in Egypt consumed much of the U.S. media. That potential scenario is likely to keep the U.S. media focused on Cairo for some time. The week’s No. 2 story was the economy, which was dwarfed by coverage of Egypt even as it jumped to 10% of the newshole, up from 5% the previous week. While there were no major developments, the newsmaking events included President Obama’s speech to the U.S Chamber of Commerce and word that more than one-quarter of American homeowners owe more on their mortgage than the value of their houses. From there, it was a significant drop to the third-biggest story, news about the Obama Administration (3%), which included reaction to Fox News host Bill O’Reilly’s Super Bowl interview with the president and Michelle Obama’s announcement that her husband had kicked the smoking habit. That was followed, (also at 3%) by coverage of U.S. anti-terrorism efforts, a topic driven in part by Homeland Security Secretary Janet Napolitano’s testimony to Congress that in some ways, the terror risk to the U.S. is at its highest level since 9/11. The final story (2%) was a new media merger with troubled online company AOL buying the six-year-old Huffington Post site for $315 million dollars. Not surprisingly, the story got the most coverage (6% of the newshole studied) in the online sector. A substantial chunk of last week’s media commentary expressed caution, if not skepticism, about the deal. Mubarak, who relinquished power on February 11, was a lead newsmaker in 6% of last week’s stories, down moderately from 8% the previous week. The No. 3 newsmaker (2%) was another prominent figure in the Egyptian revolution, Wael Ghonim, the Google executive who became one of the key figures among the protestors. The fourth-leading newsmaker (1%) was Congresswoman Gabrielle Giffords who last week spoke her first words since the January 8 Tucson shootings. She was followed (also at 1%) by former Defense Secretary Donald Rumsfeld, whose new memoir was just released and Christopher Lee, a married Republican Congressman from New York who resigned quickly after the nation learned of his use of Craigslist—sans shirt—to contact a woman. PEJ’s weekly News Coverage Index examines the news agenda of 52 different outlets from five sectors of the media: print, online, network TV, cable and radio. (See List of Outlets.) The weekly study, which includes some 1,000 stories, is designed to provide news consumers, journalists and researchers with hard data about what stories and topics the media are covering, the trajectories of that media narrative and differences among news platforms. The percentages are based on "newshole," or the space devoted to each subject in print and online and time on radio and TV. (See Our Methodology.) In addition, these reports also include a rundown of the week’s leading newsmakers, a designation given to people who account for at least 50% of a given story.